When cool cut into 6 rows lengthwise and crosswise. In a medium bowl, combine flour, ground flax, brown sugar, baking powder and salt. Stir well. Add butter, cut in with a knife into smaller pieces then with finger rub butter into dry mixture until crumbly. Stir in oats and flaxseed. Press 2/3 of crumb mixture into a 13 x 9 inch (33 x 23 cm) pan that has been lightly sprayed with a nonstick cooking spray. Spread with jam. 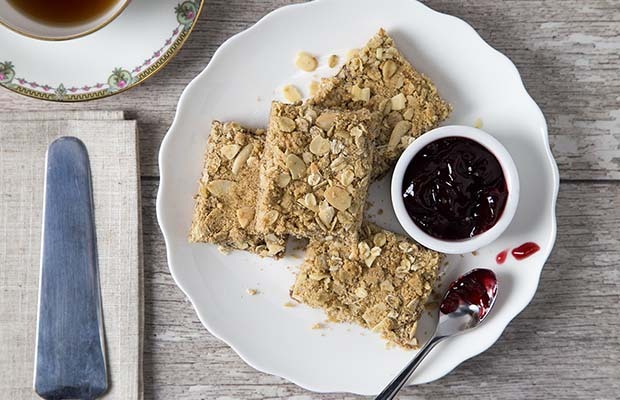 Add almonds to remaining crumbs and sprinkle over jam. Pat lightly. Bake 30 to 35 minutes or until golden. Remove to cooling rack. When cool cut into 6 rows lengthwise and crosswise. Serving Size: 2 squares each. Each contains 1 Tbsp (15 mL) of flax.